Hair and beards caught in descender. Clothing or jewellery caught in descender. Other equipment such as prusiks or slings caught in the descender. Self belay inadvertently loaded and lack of skills to unload. I have carried this super-sharp rescue knife on my harness for over 20 years yet I would like to challenge the common perception of its intended use. In fact, other than cutting lunch, I can only imagine one scenario where I would use it for a rescue. Notice also that I have had to be creative in finding a way to secure the blade from accidental opening while maintaining one-handed operation. The rescue knife should not be used for any of the scenarios mentioned above unless there is an immediate threat to life. A stressed operator suspended on a loaded rope wielding a sharp knife in the vicinity of the rope may not be thinking clearly enough to ensure that the knife does not touch the wrong thing. A loaded rope will cut very easily. A knife may or may not adequately free hair or clothing tangled in a device. A prusik may be able to be cut by sliding the blade carefully between host rope and prusik, however there are many safer and better ways to deal with these situations. Some suggestions are detailed below. Prevention is by far the best option. Know and understand the risks. Tie back hair, tuck in loose clothing, include these in safety checks, descend carefully, and know how to rescue yourself and others. Practice these in a controlled environment until they become second nature. The moment you realise that something is beginning to enter the device, stop. Tie off your device, possibly with leg wraps if hair is involved, and reach for your prusiks. Set up your ascent system and head up a move or two to unweight your device. This sounds simple, however it may be very painful and difficult to acheive if it is hair that is caught. If it is a self belay (loaded prusik) above the device that is stuck, first tie off your device and then set your other prusik for your foot to stand up and free the loaded self belay. Alternatively, bend one leg and wrap the brake rope around your foot several times. Then reach up with the tail of the brake rope and grip it against the main rope above the loaded prusik. 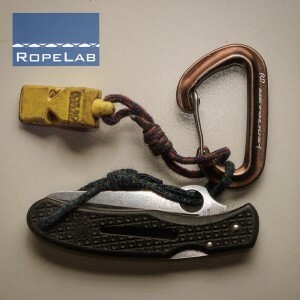 You should now be able to stand briefly and unlock the loaded self belay. While a cut-away rescue may sound fast, descending to a stuck victim has already taken time and the sense of urgency may result in poorly considered actions around loaded ropes. There are many counter balance and other non-knife rescue techniques to recover stuck victims. I am not aware of any organisation that still trains with cut-away rescues for non-urgent recoveries. If you are guiding or facilitating an experience then expect that things may go wrong and have systems in place and so well rehearsed that, on occurrence, resolution is trivial. You must rig your system in advance, to be able to quickly clear a tangled device. If a descent is belayed from above with a separate rope, then introduce slack into the abseil rope by either unlocking the releasable anchor or raising the belay. If a bottom belayer (or fireman’s belay) is used then the rescue is no longer trivial. The bottom belayer must arrest the descent and wait for someone else to descend next to the victim and then establish a long foot loop on the victim’s rope for them to stand up and release the jam. Two situations where a knife may be useful both concern asphyxiation and thus are an immediate threat to life. Drowning, as a result of being held under water (canyoning or swift water rescue). Strangulation, as a result of something around the person’s neck (perhaps a bandana) becoming entangled in the descending device. If this occurs in a guided activity and there is a separate belay managed from above then I may choose to lock off the belay, step between the main and belay ropes, and then cut the main abseil rope in a direction away from the belay rope. It is often all too easy to sit back and say “they should have carried and used a knife”. If we truly think through the potential consequences of this action then I suspect this is rarely appropriate. The only time I would reach for my knife is if a loaded rope presents an immediate threat to life and, in cutting it, I have minimised the likelihood of making things worse. 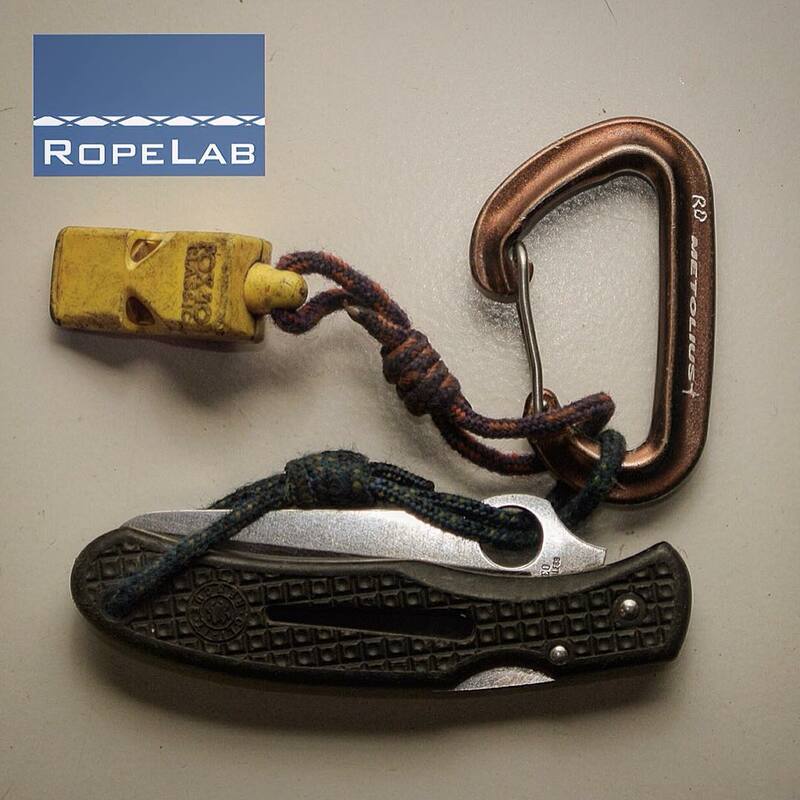 In over 20 years of work as a rope technician, instructor, and rescue operator I have never used my knife for rescue. It has however been a key part of many meals in amazing places. © Richard Delaney, RopeLab, 2015. Eduardo José Slomp Aguiar has been kind enough to translate this article into Portuguese. We are grateful for his input. The Portuguese translation can be found here. RopeLab Quiz 4: Knot or Not?